Dwarves, that talk using emotes! Today I decided on writing a bit more about level mechanics. I keep talking about little bits of it, about challenge and so on, but I never really just explained it straight forward. I would also like to hear people’s opinions about it. Everything in project started with the idea of making game that in a way would be like Spelunky. If you don’t know that game - it’s a platformer where you have to complete all levels in one run, without dying, and every time you die and start over again, you get different levels ( there is of course more, I suggest you should find it out by yourself on their page ). Of course, I didn’t want to make the exact copy, or "extended" version. My game was supposed to be more like dynamic platformer, being more forgiving for made mistakes, but still giving a bit of challenge on each step. I also decided on having map editor rather than randomly generated levels. They still have a bit of randomness inside, but it’s more of visual thing ( did you notice dwarves having different colours of clothes each time? ). I started to see some problems in it when I thought about the story. I thought of multiple bosses being a thing, but then there is just one boss level that is always there. At some point I decided on having one shop in "lobby" map, rather than little shops spread across world ( I talked more about shop system in previous post). My current idea is to divide game into worlds. Each "attempt" will be trying to finish a single world. Each of worlds will have different bosses, different levels and different challenges. 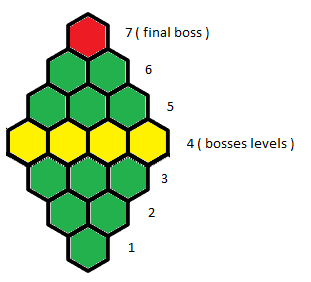 I plan on 7 levels per gameplay, where 4th level will always be one of fixed bosses ( in earlier version I planned mini-bosses to be just random levels, a chance was that player would never do one ). Each of green levels will be picked randomly and have one of few possible targets. It might be just finding a key and exit, it might be having to capture few points or defend someone. I will talk more about it in the future! Further worlds will become harder, and you might need to prepare for them before going in! Thanks to worlds, I will be able to keep story telling stable on boss levels, while also being able to create as many possible levels as I desire. Beta version, contains 10 normal levels, 1 boss level, few different weapons and 1 collection. First demo of Shard Hero, containing tutorial/prologue level that shows all in-level mechanics.